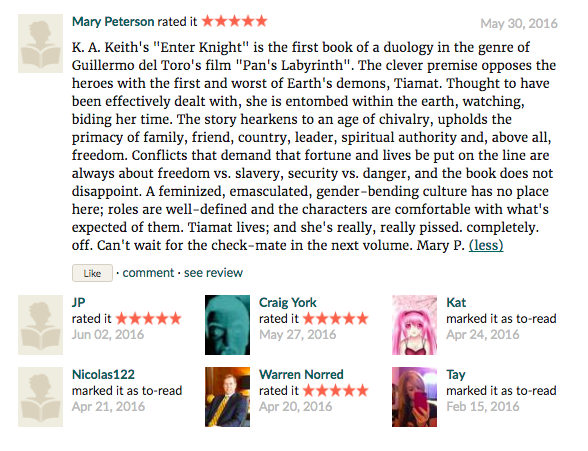 Click to see the positive reviews of Enter, Knight from Goodreads! Enter Knight is an excellent read. The characters are extremely well developed, with their own uniqueness and twists. How the party comes together to fight an insurmountable evil is most entertaining. The plot deepens with every turn of the page. No less developed are the antagonists, you feel the depths that evil can go; seeing all good attributes with such disdain as itself is seen by common folk. I am now into the sequel, Hel’s Storm, and it is as suspenseful and action packed as Part 1. Well done K.A. Keith. You have a winner. Rating 5 out of 5. I will easily recommend Enter Knight & Hel’s Storm to my family and friends, and to whomever asks if there is a good new fantasy novel out there!